What causes this symptom, and what can you do about it? One of the most common signs of a cold is a sudden need to constantly blow your nose – whether because it’s running so much or so blocked up that you can’t breathe! 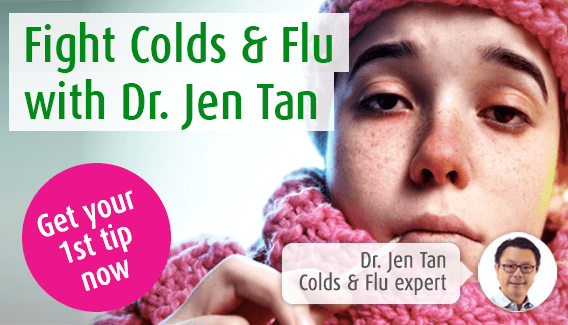 In this article Dr. Jen Tan explores what causes extra congestion during a common cold and what you home, herbal and natural remedies can be used to ease this symptom. If you’ve got a case of the common cold, your nose can cause all kinds of trouble – one minute it’s so runny that you can barely keep up, and the next it’s so blocked up that you’re struggling to breathe. The more you blow your nose, the more red and irritated it becomes, leading to that all-too-familiar Rudolph nose. So what causes this symptom and what can you do about it? What causes a runny or blocked nose? Both of these symptoms are caused by excess mucus in the nose, which is produced in an attempt to flush out bacteria. This extra mucus drains out of the nose, causing what we know as a runny nose. It can also drain down the back of the throat – yuck! However, if your nasal passages become inflamed, this can make it difficult for this extra mucus to drain from the nose, causing congestion, or a blocked nose. This can often get worse at night, since when you lie down the mucus is no longer able to drain out of either the nose or down the throat, so it gets stuck in the nose. There are a few things you can do to ease your runny or blocked nose. Try filling a bowl of water with steam and gently breathing it in through your nose. Adding a few drops of essential oil, such as our Po-Ho oil, can help to speed up this process. If you have a runny nose this will probably make it worse, which is actually a good thing as it will flush out the excess mucus faster. If you’ve got a blocked nose, it will loosen congestion. If your nose becomes blocked while you’re trying to sleep, place an extra pillow under your head. This will prop your head up higher, allowing mucus to drain down the back of the throat as it should. To treat the overall symptoms of a cold or flu, we’d recommend Echinaforce. The liquid and tablet versions are perfect during the day while you’re out and about, but you may find the Hot Drink particularly soothing before bed. You can also use our Sinuforce Nasal Spray to ease your nasal problems specifically. This nasal spray is a natural complex of eucalyptus, peppermint and chamomile oils in a saline solution that helps to clear congestion. It’s gentle on the nasal passages so it can be used by anyone over the age of two for up to 30 days at a time – great for those stuffy noses that just won’t budge! There are a few over-the-counter medicines you can try for a blocked nose. Decongestion tablets such as Sudafed can be helpful, but bear in mind that some contain paracetamol, so just make sure this doesn’t interfere with any other medication or pain killers you might be taking for your cold. Some decongestants also contain caffeine, so be wary about taking these in the evening – during the day, however, this caffeine can be useful to give you some extra energy when you’re feeling a bit sluggish and unwell. You can also buy conventional nasal sprays from your pharmacy or health store, but pay attention to how long you can use these for at a time – most are around 7 days. Some also have a number of contraindications so check these before you buy.